Merriam-Webster says twill weave is “a textile weave in which the filling threads pass over one and under two or more warp threads to give an appearance of diagonal lines”. Interestingly, the most common form of twill weave fabrics that almost all people are familiar with is denim. Yep, denim blue jeans are a twill weave fabric. And the word “denim” is derived from “serge de Nimes” – a region in France where the textile serge was produced. Cool, huh? I love learning more about the origin and meaning of words! Twill is one dang sturdy weave. Have you ever seen or worn a wool gabardine suit? Long-wearing, huh? Denim – built to last. When you think about fabrics with a nice draping quality, skip right on past twill weaves. They do not hang in soft folds from the bias. They stand up in the corner by themselves! Denim is one of my all-time favorite fabrics, and if I can ever FINALLY FINISH my latest jeans I will even post a picture of them. Soon. I promise! 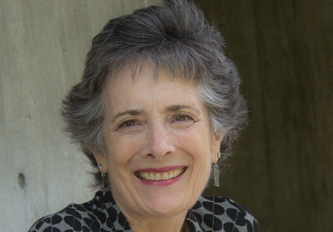 Last week’s giveaway – Pamela’s Bias Skirt pattern – is going to lovely Cindy! I loved your comment about making a fun skirt out of recycled T-shirts – what a great idea! 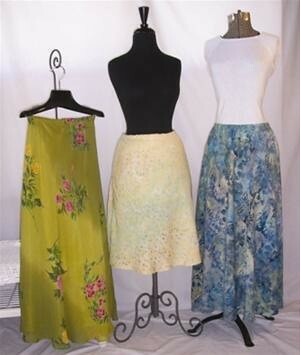 Thanks to all readers for posting, and I hope you enjoy this skirt pattern, Cindy! Sometimes sewing is an exercise in patience. And I don’t have much! I had a new pair of jeans nearly finished – they just needed the waistband, belt loops, and a button and buttonhole. I was shortening the metal zipper so I wouldn’t have unnecessary little metal teeth in the waistband, and …… you can envision what happened, right? Despite adding a thread bar tack to stop the zipper, the pull slid right off the end. &*^@#$&*^# I tried my darndest to get that stinkin’ pull back on, and finally decided it would be faster and easier to put in a new zipper. I was sooooooooo sad to rip out the beautiful red topstitching around the fly. I guess I will be getting more topstitching practice soon. Sigh. 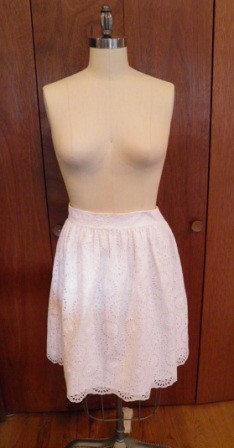 My white eyelet skirt for spring and summer is ready for wearing! 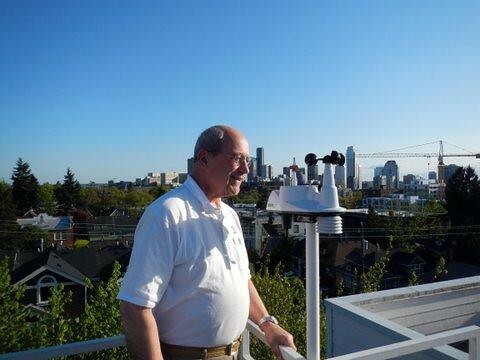 Now all we need is warmer weather here in the great Pacific Northwest. I love, love, love this fabric, and also how quick this skirt was to make. Two pieces plus a waistband – easy peasy. Of course it needed a lining, but a two rectangles is about as simple as it gets. I made French seams so the finish was totally clean on the inside, and also so the seam allowance looked minimal from the right side. And of course then I had to also do it on the lining. Just cuz. I think I am going to enjoy this skirt. I probably ought to get going on a few new tops to go with it, right? 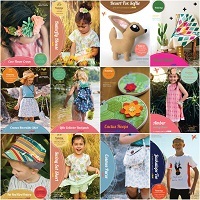 Let’s start the week off right with a FREE pattern giveaway! Summer is coming, and I bet you are itching to make a few flirty little skirts to wear with those new sandals you ordered. Pamela’s Favorite Bias Skirt pattern should fit the bill nicely. It comes in 2 lengths, as well as a slim and fuller version. Wouldn’t this be cute sewn up in a soft cotton voile, a pretty batik, or even a lightweight silk? Leave me a comment about one of your favorite skirts from a previous or current wardrobe, and I get to select my favorite skirt story. Your comment can be about why you loved the fabric, or something funny that happened while wearing your favorite skirt – whatever made it a special memory for you. To be considered, please leave your comment by eod May 25th, and I will announce the winner of this sweet little pattern on Tuesday, May 29th. Good luck!! 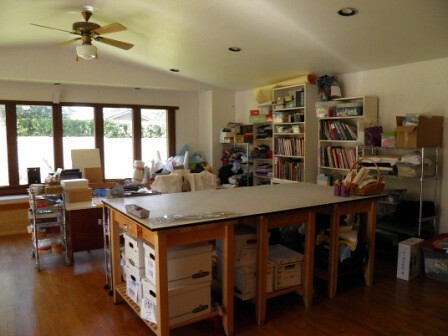 My sewing studio has never been perfectly tidy. Not ever. I consoled myself that sewing is a messy art form, and since I generally had many projects underway at once, of course my sewing space would have a few piles. Last week I got a little inspiration from a sewing friend to tackle some of my thorny irritations. Kris Collins, of Sound Stitches, gave a presentation at our local ASG chapter suggesting some ways to organize a sewing space. At first I thought I would just try one or two of her suggestions, but I became obsessed! I spent hours folding, sorting, throwing out, categorizing, and cleaning. And I loved the process, as well as the result. How crazy is that! 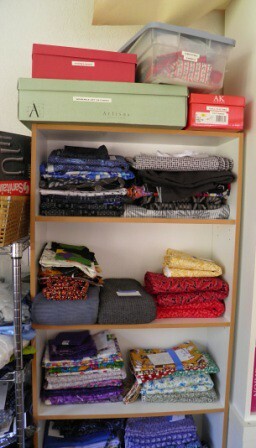 This large Ikea storage unit my DH bought contains knit, outerwear, silk, linen, wool, and some cottons. The center and right top drawers hold all the shirting fabrics for my DH’s shirts. Sheesh, I’d better get busy. 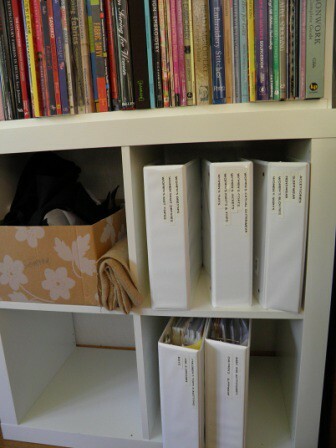 Thank goodness I finally wound my assorted interfacings on cardboard fabric holders. Those messy piles always falling on the floor made me nuts. 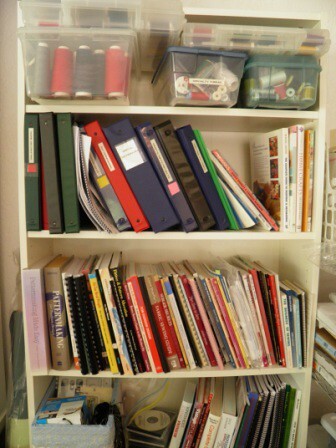 I bought one new bookcase (used from Craig’s list), and folded all my cotton prints over a 24×6 inch ruler before filling the shelves. When Kris suggested this I thought there was no way I would ever do anything that compulsive. But once I tried it, I just couldn’t stop. So satisfying. Kind of like folding clean diapers when the kids were all little. So many books! 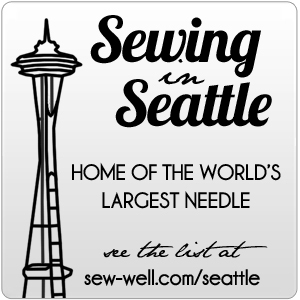 And thread – but I did clean out loads of serger cones. What was I thinking with all those colors? More books, buttons, a container of zippers, some antique laces on the upper left, and my Amanda smocking pleater. 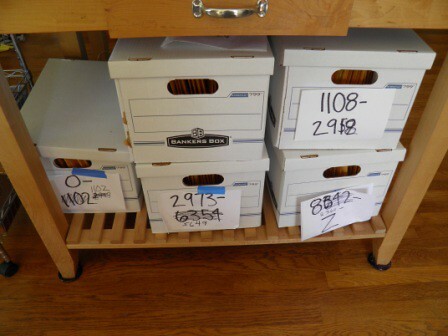 These boxes contain large manila envelopes with the pattern tissues and instructions, organized by pattern number. How did I ever buy so many patterns?!?!? 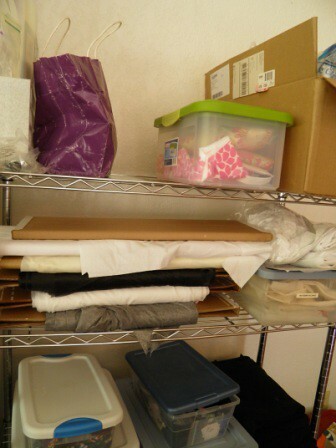 I went thru every pile, box, and bag in my sewing studio. I donated 2 large bags of scraps to the Bellevue Boys and Girl’s Club Pre-school, 2 bags of clothes to charity, and a gi-normous pile of fabric, serger threads, and notions to my local ASG yard sale. 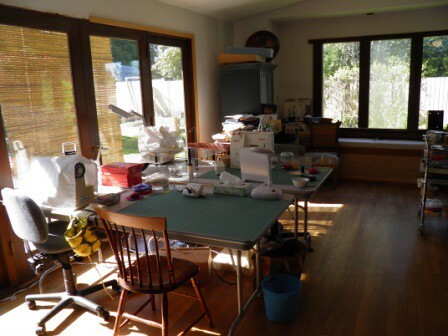 My sewing studio feels so much “lighter” without the weight of unnecessary supplies and projects that I had no intention of ever finishing. 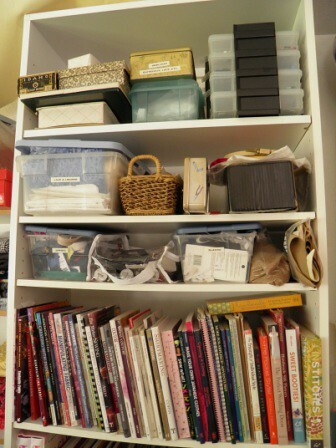 I definitely recommend making the effort to clean out and organize your sewing space – thanks for the inspiration, Kris! 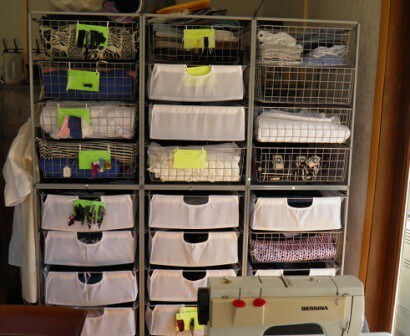 Have you ever tried interfacing from Fashion Sewing Supply, owned by Pam Erny? Do yourself a favor and order yourself some great interfacing. Forget that cr%#y paper stuff (sold in Joann’s) that masquerades as interfacing. Buy actual fabric interfacing from Pam. You won’t regret it. 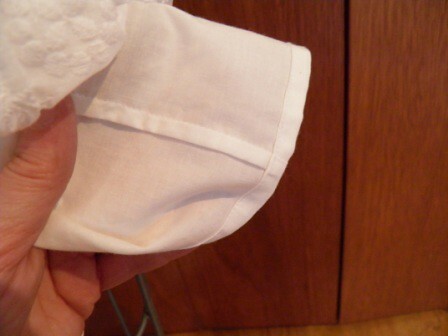 I double-heart the woven Shirt Crisp for my husband’s shirt collars and cuffs, and I also use the Pro-Tricot for all my knits. I think I will try out the new Pro-Woven Light Crisp interfacing as a general purpose fusible for medium weight cottons.Hmmm, maybe I need some more Pro-Sheer Elegance too, since I think there may be some lightweight woven cotton in my sewing future. How about you, dear readers? 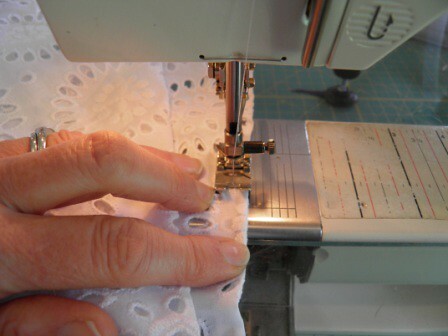 Have you ever tried Pam’s interfacing? Do share your thoughts! 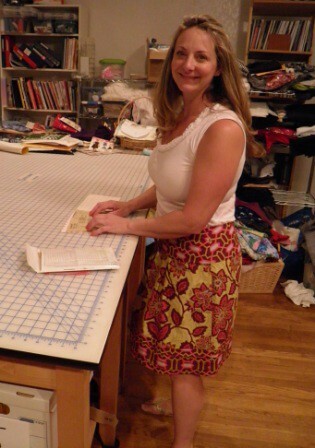 Don’t look at the big mess in my sewing studio – check out the big smile on Stacey’s face! I am pretty sure it has something to do with that stinkin’ cute skirt she finished up a few weeks ago that she is modeling here. Or maybe it is the new dress she is cutting out and prepping – her second garment since she started sewing lessons. This lady know how to get things done, she has a great eye for color and pattern, and I especially love how we laugh nonstop during her lesson time! Have I mentioned before that sewing students totally rock? Keep it up, Stacey, I can’t wait to see how the red and white dress turns out! I am so excited! Sewing for the current spring/summer season actually commenced TODAY. 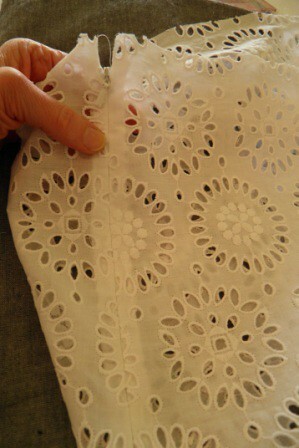 I bought some uh-dora-bell white cotton eyelet at Nancy’s Sewing Basket last August, and today it started on a path to becoming a wearable garment. Amazing! 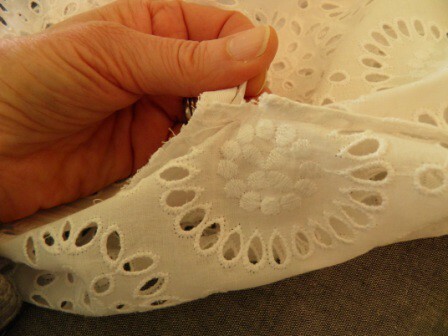 I don’t remember the last time I sewed on eyelet – but it definitely has been a while. I decided to use French seams, partially because I love the look of them, and partially because I wanted a narrow, completely finished seam inside. Sheesh! Stitching straight on heavily embroidered fabric with lots of holes requires focus, people. And lotsa controlling the fabric going under the presser foot. I couldn’t sew at my usual warp speed, that’s for sure. This skirt is dead simple. A front, a back, and a waistband. Since I cut the front and back cross grain and both eyelet selvedges are scalloped, I don’t even have to hem it. Sweet! Well, there is a lining too, but still – not a tough project. The invisible zipper went in without a hitch. Here are my tips for making this a foolproof process. 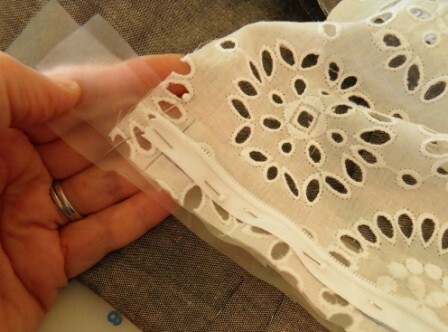 Lay a strip of water soluble stabilizer on both sides of the fabric, and then pin the zipper on top of the stabilizer. The stabilizer really made the stitching smooth and stable. After both sides of the zipper are stitched, trim the seam allowance so that it is even with zipper tape and overcast the edges together. Might be a little hard to see in this pix, but I love how neat and finished the zipper looks on the inside. I clipped the seam allowance below the zipper tape so I could continue my francophile ways and make a French seam below the zipper. Nice! Here is the finished zipper, and it looks perfect!! The white cotton lining is mostly completed and ready to go inside the skirt. 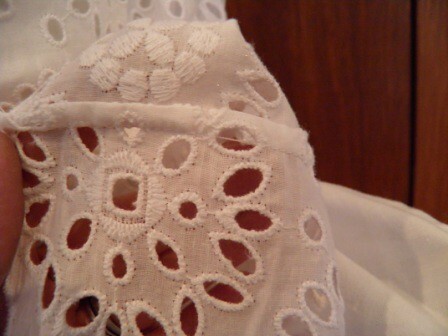 I want the lining to hang free so that the eyelet holes are really visible. Probably I will have to whip the lining seam allowance to the zipper – at least at the very bottom – and possibly also down both sides of the zip. But I still think the floaty lining inside the skirt will look best. I hope I can finish it tomorrow…wish me luck, dear readers!